Figuring out if someone is bluffing or not, is an integral part of the game of poker. Usually, you try to determine if someone's bluffing or value betting by studying their betting patterns, see how comfortable they look at the table, and search for Oreo cookie tells. there are only two options; either they're bluffing, or they're not. But, for the new PokerStars promotion 'Truth or Bluff,' you'll have to do with just a couple of seconds of speech and some facial tells. Fortunately, entering is free, so even if you have no idea, it's not going to cost you much. Also, there are only two options; either they're bluffing, or they're not. 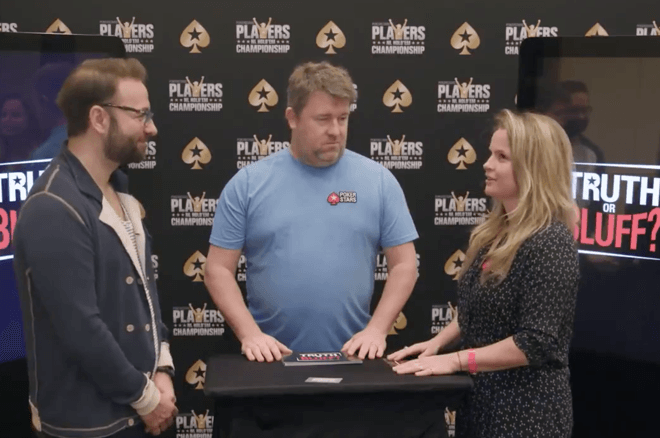 You can test your skills with the video on Facebook where you can try to dissect Daniel Negreanu's poker face when he's trying out the game with Liv Boeree. You can even win a signed PokerStars Poker Championship hat. Now, and this is easy, you tweet back to the guys and girls at PokerStars with your answer. Mention 'truth' if you think Fatima Moreira de Melo is sincere to Daniel Negreanu, or 'bluff' if you think she's full of it. 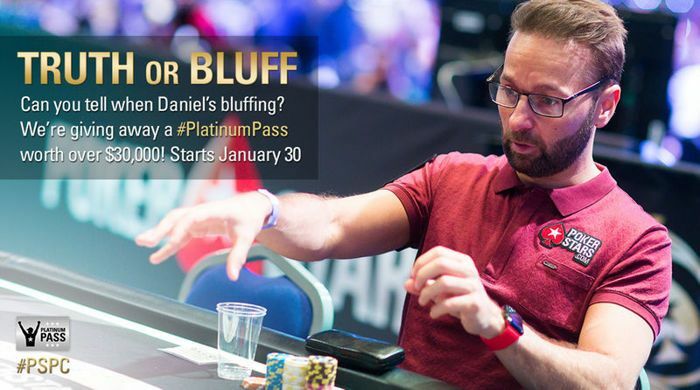 Add the hashtag #PlatinumPass and your PokerStars screen name, and you're done. Your answer to this first video should be in before Thursday. PokerStars publishes more videos the coming weeks, and you can enter as many times you like. Everyone who takes part gets an invite to a freeroll tournament on Sunday, March 4. If you have more than two answers correct, you'll get extra chips in the freeroll. The winner of the freeroll walks away with a Platinum Pass worth $31,000! There are also other prizes up for grabs, $5,000 worth of them. So check out the video, make up your mind whether Fatima Moreira de Melo is telling the truth or not, and enter the competition by tweeting back. Who knows, maybe we'll see you at the PokerStars Player Championship in 2019!